Even though I have lived in Ohio since 2009, there are still so many places I have yet to see in person. The Reformatory has always been one of those sites that not only appeals to the history buff in me, but also to the lover of “abandoned places”, old architecture and cinematic sites. So, on a hot and rainy June day, the three of us piled into my Jeep, Lola, and made the hour and a half journey to Mansfield, Ohio. As we made our way down the wet drive, through the gates and along the long approach to the prison, the magnitude of the place began to settle in. Looming overhead was the harsh beauty of the place. It has this sort of rugged vibe, perhaps it is the age of the place, or maybe the fact that it was a prison, housed the “troubled” of society, or it could simply be because it stands empty except for the visitors that walk the echoing halls of peeling paint and rusty bars. Whatever the reason for this air it gives off, it seeps into you as you approach, down the long driveway and make a right into the parking lot. 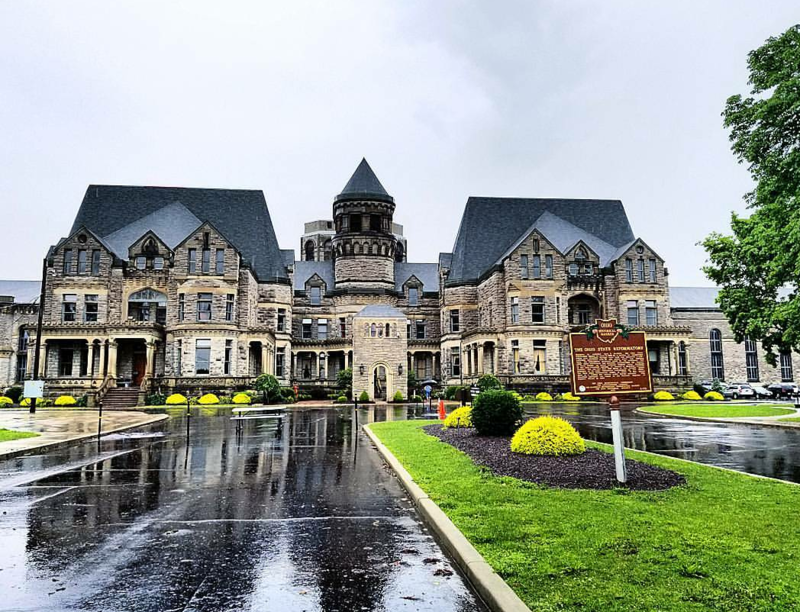 Built in 1834, it was the second Ohio Penitentiary, third state prison and the fourth jail in Columbus. You can read the full history as well as the cinematic history here. We ran, the 20 feet or so to the open door at the top of the steps, only to be told that the entrance was around the corner and made our way through the rain to that. We were soaked, but excited to be there and experience the history. We wrung out our hair, tied it all back as best as we could, and found a bathroom before making our way on the self-guided tour. Throughout the entire prison, there are pieces of cinematic history. Markers tell you where you are and what the rooms were used for during different points of the facility’s history. Some rooms looked familiar from various films. Markers, and life-sized cutouts of characters from the films, tell the story of what scenes were filmed in each location. The size of the prison is overwhelming. Standing on the lowest floor or the highest walkway in the giant cell blocks, it is impossible to not be hit by the sheer magnitude of its size and history. Tucking yourself into a dimly lit, decrepit cell and swinging shut the bars, you are immediately hit with the reality of the confinement and if you close your eyes you can imagine the loneliness and the weight of serving time in a place like this may have been, day in and day out. The paint peels like wet sheets of paper, shredded and flowing to the floor every where you turn. We made our way through the maze of hallways and rooms, through the warden’s apartments, the chapel and office rooms. We found layers of history chipping like weathered enamel glaze from the previous layer like pressed pages of a book. Wallpaper gave way to painted plaster over stone walls surrounding creaking floors and pristine stained glass windows. There weren’t too many visitors on June 23rd, when the three of us made our way throughout the place. The sound of our footsteps often echoed along the corridors and though we were mostly alone, just our little trio, we found our voices hushed and our words often few, as if we were avoiding the possibility of disturbing the tortured and violent souls of those in solitary confinement. Solitary confinement is a lesson in contrast from the overwhelming size of the cell blocks. Prisoners found themselves in even smaller cells, with either open bars and constant light, or sealed into a dark space with no light, except for when a small slot was opened to slide food. After the incredibly oppressive walk through solitary confinement, we made our way back up stairs and found our way to what was once a library and also served as a medical unit at one point. In all there is too much to say about the experience. It was educational and overwhelming. Photos never do it justice. It is impossible to fully convey the magnitude of emotions and realizations that wash over you in this place. You just have to see it for yourself!